This paper compares precipitation, maximum and minimum air temperature and solar radiation estimates from the Hadley Centre’s HadRM3 regional climate model (RCM), (50 × 50 km grid cells), with observed data from 15 meteorological station in the UK, for the period 1960–90. The aim was to investigate how well the HadRM3 is able to represent weather characteristics for a historical period (hindcast) for which validation data exist. The rationale was to determine if the HadRM3 data contain systematic errors and to investigate how suitable the data are for use in climate change impact studies at particular locations. 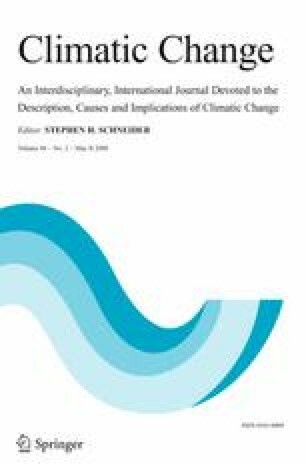 Comparing modelled and observed data helps assess and quantify the uncertainty introduced to climate impact studies. The results show that the model performs very well for some locations and weather variable combinations, but poorly for others. Maximum temperature estimations are generally good, but minimum temperature is overestimated and extreme cold events are not represented well. For precipitation, the model produces too many small events leading to a serious under estimation of the number of dry days (zero precipitation), whilst also over- or underestimating the mean annual total. Estimates represent well the temporal distribution of precipitation events. The model systematically over-estimates solar radiation, but does produce good quality estimates at some locations. It is concluded that the HadRM3 data are unsuitable for detailed (i.e. daily time step simulation model based) site-specific impacts studies in their current form. However, the close similarity between modelled and observed data for the historical case raises the potential for using simple adjustment methods and applying these to future projection data.